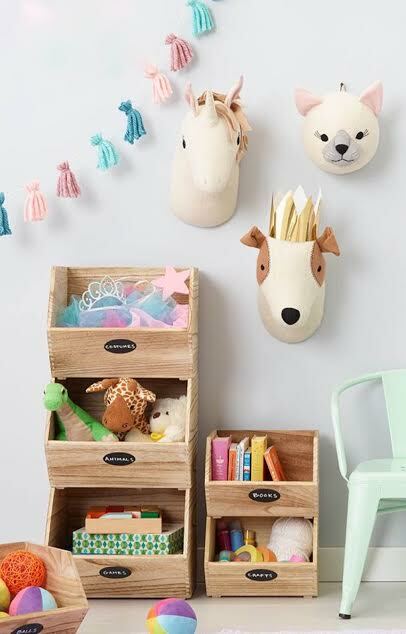 As you all know I love decorating kids spaces because they are such fun, imaginative places. 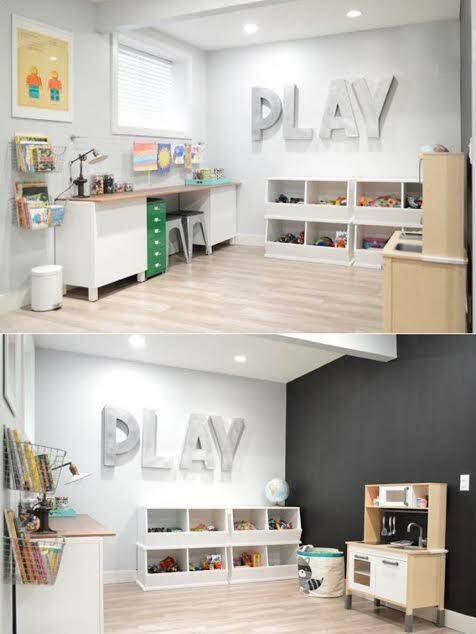 Today I wanted to share 5 tips for decorating your playroom so that it still feels like it blends with the rest of your home and is an enjoyable place for you to be too. After all, a lot of times we are right with our kids in the midst of playtime and there is no harm in enjoying that space too! When it comes to creating a room that encourages play I think one of the biggest things to avoid is going crazy with you paint colours. A lot of times we think that all these primary colours on the walls are great for kids but in reality, if you are finding the colours to bright and overstimulating then odds are your little one is too. 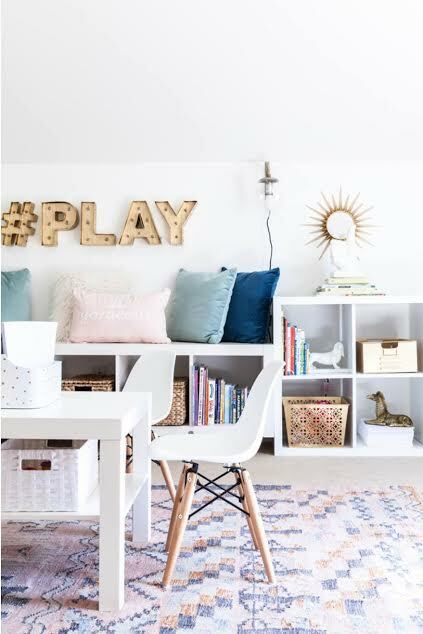 Just remember kids toys are full of colour, texture and over all are created for creative play so there will be plenty of "fun" in the room without going crazy on your wall colour. A lot of times there toys will stand out more to them in a neutral space rather then just colour everywhere they look. 1. De-Clutter- The first and most important tip is to de-clutter the room. Kids seems to accumulate so many toys and rarely do they play with all of them. They likely have their favourites but other then that I think it is really important to purge the space. 2. Furniture that performs "double duty"- Choosing pieces like storage ottomans, shelving with storage bins helps to organise everything but still looks pleasing to the eye. It's a great way to sort block, legos, dolls and all the smaller items. 3. Wall Book Shelving- Using shelves on the walls to display books is a great way to encourage kids to read and look at them. You can swap out different ones they like to keep things interesting. 4. Play Forts/ Hideaways- As most parents know kids love hiding and building forts so why not incorporate a permanent style that looks great but also provides them with a play to use their imagination. 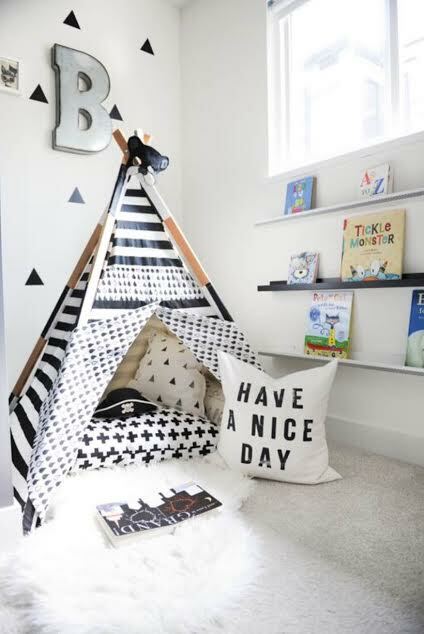 I am a huge fan of play tee-pees, I think they are perfect in playrooms/bedrooms because they are fun for kids and look great at the same time. 5. Hanging Family Photos/Art- Using a playroom as a place to display happy family memories is such a great way to decorate the space. Kids love seeing pictures of themselves so what better way to decorate then to adorn some of the walls with some pictures of the people they love most. You can also incorporate some photos or art pieces that they have created to really make them feel proud! I hope you enjoyed these simple tips, have fun decorating!